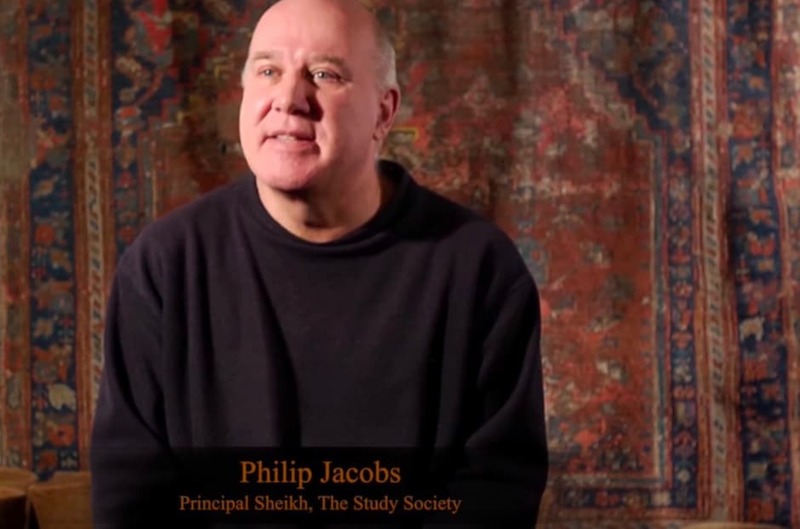 This Overview introduces a 5-part interview between Paula Marvelly and Philip Jacobs, resident Sheikh of the London-based Study Society, discussing Advaita, Sufism and the turning ceremony of the whirling dervishes, and in particular the way in which sacred dance can be a direct means for accessing, and becoming one with the Divine. Paula Marvelly is the creator and editor of The Culturium, a magnificent site about Art and Consciousness. Paula was also a former editor of Stillness Speaks. In Part One of Sacred Whirling, Sufism & Advaita, Jacobs discusses his background as an artist …. In terms of finding a career, the only thing I was really good at was painting so it meant my career direction just had one path to go down, which was an art career. There’s a Joseph Campbell quote, ‘Follow your bliss.’ If you follow your bliss, doors open for you where you didn’t know doors were going to be. When I am painting, I just get so happy. It’s like when I learnt to meditate. Why I can relate painting to meditating so well is that I become quiet and a great happiness emerges from inside. Paula asks him about his role and work with the Sufi Study Society…. My role is to be in charge of the whirling dervishes and the main ceremony, called the mukabele. We also have other activities like drumming groups, music groups and poetry groups, which are under the umbrella of the dervishes. Lots of young people are starting to come into the classes and be a part of the group, and as a by-product they start to access their true Being. Next Jacobs talks about the dervish order in Turkey and goes on to describe the function and purpose of the turning dance tradition. The technique for the Mevlevi turning we teach is very precise. The learning of it is probably the most physically demanding thing anyone ever does in their lifetime… It’s amazing to watch people in the process. The whole technique is about opening the heart but before that happens something must take place; there is a dervish word, bash kasmak, which means ‘chopping off the head’. During the process of training and the ceremony, the rational discursive mind gradually starts to fall off and you can actually see this happening to people. This conversation continues in Part 2 of Sacred Whirling … Philip Jacobs begins by answering Paula Marvelly’s question: Is the turning like meditation in that it builds up a residue of stillness? …it builds up an accumulative energy. In Sanskrit, it’s called sattva, the energy of being, which gradually permeates you. With the dervishes, after a good mukabele, you have a beingness that is palpable afterwards for many days. Rumi had been an academic philosopher and was ripe for meeting the great mystic, Shams of Tabriz. When they met, it was described as the meeting of two oceans, which is a metaphor I rather like. That’s when Rumi’s heart opened and he ‘found’ himself. Part 2 concludes with an insightful exploration of the sufi turning dances and what “turning” offers in terms of awakening. Essentially, the teaching is that you have a temporal identity in time and then there is your inner identity, which is often referred to as the heart. Nondualism is very hard to explain in rational language because it is a model of experience. What it implies it that everything is part of one whole, there’s just one thing. In dualistic philosophies, you get two things: God and man, good and evil, and a whole variety of dualities. With nondualism, everything is perceived as a manifestation of one being. And it’s not even correct to say it is a manifestation of one being, it’s more that everything is the very substance of consciousness. As you grow up, you learn that you are separate… You start to experience yourself as a separate ego in a world of multiplicity, and that’s very necessary for relating to other people in the world of manifestation and the world of the drama. You have to have a healthy sense of being a separate self and that’s very important. So the first stage I would call, ‘I am everything’. The second stage I refer to as, ‘I am something’. You are now starting to experience yourself as a separate self, a separate ego. The plus side is that you can relate to other apparent separate selves and the drama of life goes on; the down side of that is you start to experience a cycle of both pleasure and pain. So when the world goes in a way that appeals to you, then you are very happy. When things don’t go your particular way, then you are very unhappy. And yet this cycle goes on. Later in life, you may start to question ego centered existence… you get a bit fed up with the cycle of pleasure and pain and you want to try and find something that you feel exists and lies beyond both pleasure and pain. This is when some begin to look for deeper answers and may turn to meditation, tai-chi, sufi dancing .…when you do start to look inside and see what lies behind your eyes, it can almost come as a bit of a shock. It’s like what you discover is that there is nothing there at all; it’s as if there’s a great emptiness that’s lying behind your psyche and body-mind. But that’s not the end of the story because beyond that, is the unity experience of ‘I am everything’, and you discover that there is a presence that sits behind your psyche. That background state is deep stillness. Sacred Whirling Part 4 continues with Jacob’s thoughts on the oneness inherent in nondualism. …you are already the one consciousness, you already are the unified state but you have to go off and say ‘yes’ to the great adventure of life. In a metaphorical way, you have to leave who you think you are, and via a strange route, you come back and rediscover that principle of unity in a much fuller way. The stages that Jacobs has been describing can be related to as four levels: the physical level; the subtle level; the causal level; and the divine level. Jacobs provides a profound explication of these levels and what they mean for consciousness, awareness and our own connection to the divine. So the divine level is the one mind, the one consciousness, which is also the same thing as who you are … One of the ways in which I find it useful for looking at this is to look at it from ‘bottom up’ and ‘top down’. In nondual traditions, particularly Buddhism, they have what they call absolute and relative knowledge. Relative knowledge relates to the bottom up view; so from the bottom up, which is the view of Reductionist science, you’re a physical body in this vast physical universe, which is all running to the laws of physics. Jacobs closes this interview series with Paula Marvelly…. What happens in my experience with various practices like meditation, yoga and dervish turning is that this vehicle, specifically the subtle and causal levels, becomes transparent. Rumi often uses the analogy of the mirror and polishing the surface of the mirror. From my perspective, all of life, including all the various things that have happened, are all a part of this process of becoming transparent. Sometimes you just have it for moments, but it’s as if you don’t exist, you’re just the vehicle for something flowing through you. For more information on the whirling dervishes, visit the Study Society website or The Whirling Dervishes of West London on facebook. Opening Quote: Excerpt from Coleman Barks prose in the chapter “The Turn” in his book, The Essential Rumi, Translations by Coleman Barks and John Moyne.